Hello and happy Tuesday. I'm back with the SIP design team today with a new card and a reminder to play along with our first challenge. Since this is a Getting To Know You Challenge, this should be an easy one. Just make a card that is a "you" card and link it up! I had fun playing with some old and new products for this one! I used the new Brick Wall Embossing Folder, oh how I love this one! 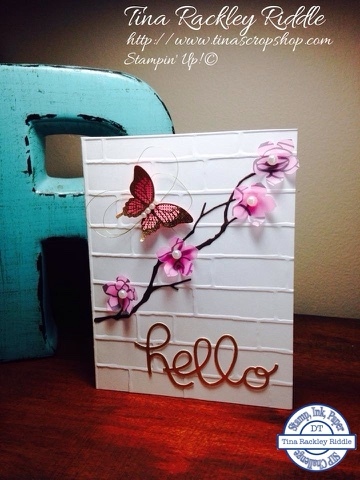 My butterfly was from Polka Dot Pieces and was heat embossed with Gold embossing powder onto Rose Pink cardstock. I adhered some of the new Gold thread with glue dots and then attached my Butterfly over that. I used a Memory Box Woodland Branch die with punched flowers made with the petite petals punch. on Printed Vellum that was a freebie from SAB and I used my Blendies to color on the backside. I put a Pearl Jewel embellishment into each of the flowers. The "Hello" was from the Hello You Thinlits and was attached with SU 2 way glue. 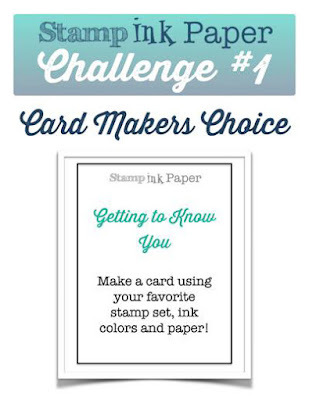 So now that you've seen my card head on over to Stamp, Ink, Paper Challenge Blog and link up your own card! Those flowers are gorgeous! Love the sweet butterfly,too! So pretty! I love the delicate branch and those beautiful flowers!